Repeated measures: In medical research repeated measures (Longitudinal) data analyses are very common. Diabetes patients are followed periodically over time (every 6 month for example two years) to study the impact of treatment in HbA1c level. The usual regression analyses assumes that the repeated measure data is independent, while they are dependent (correlated) in nature. Or the observations within an individual are correlated. Assuming independence while the observations are correlated would provide a narrow CI for the regression coefficients thus paving the way for highly significant results. Therefore the right analyses would be to capture the amount of correlation within the individual level and adjust that correlation in the regression analyses. This procedure is called Generalized Estimating Equation (GEE). Multilevel models are basically regression models of data that have a hierarchical or clustered structure. Such kind of data arises routinely in many fields, for instance in growth studies (where students are nested within class rooms and class rooms are nested within schools. Thus the first level is class room and the higher level is school), family studies (with children nested within families), and in medical research (with patients nested within physicians or hospitals). Clustered data may also arise based on specific research design. For example, in large scale survey research the data collection is usually organised in some sort of multistage sampling design that results in clustered design. Hierarchical linear models, Random coefficient models, Variance component models or multilevel random coefficient models are other names for the multilevel models. Repeated measures analyses is a single level MLM. Practicals and Software: Practical will be followed by a lecture and real time data will be used for practicals. Practicals will be taught using SPSS, MLWIN (copy will be provided) and STATA. 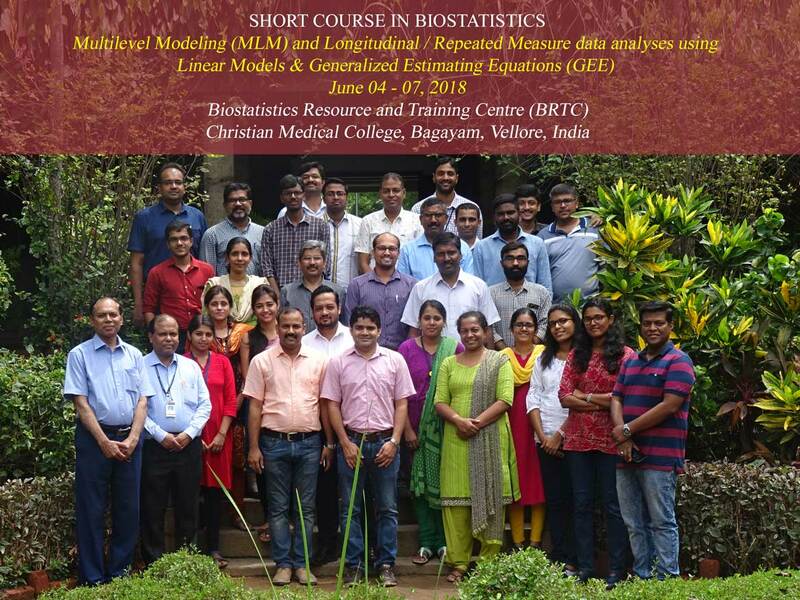 Who should attend: Biostatisticians/ Statisticians, Epidemiologists, Medical Researchers and Social Scientists who have basic knowledge in Regression analyses. Christian Medical College, Bagayam, Vellore 632 002. Participants will have to bear their own expenses for travel, boarding and lodging. The Organizers will provide Lunch and Snacks. However, the organizers may arrange basic accommodation with A/C facility in the college campus on request. Only limited accommodation is available on campus and priority will be given to the female participants. Course Fee should be paid in full by May 28, 2018. Payment can be made by Demand Draft in favor of “Christian Medical College Vellore Association Account”, payable at Vellore. The number of participants for each course is limited to 45 and admission will be purely on first come first served basis.